There are two main ways that you and your health care team measure your control. There are two ways to monitor your blood glucose levels: the glycosylated hemoglobin test (the HbA1C test or "A1C" for short), and home self-monitoring of blood glucose (SMBG). The A1C test measures the amount of glucose in your red blood cells, and this provides an average of your glucose control over a period of two to three months. The result is given as a one- or two-digit percent number. The standard goal is to keep your A1C at 7.0 percent or less (according to standard set by the American Diabetes Association) or 6.5 percent or less (according to the American Association of Clinical Endocrinologists which prefers a stricter measure). Your physician is likely to schedule an A1C test as often as four times per year. This periodic check on your A1C is an important monitor for your health. However, don't be surprised if your A1C is higher than the recommended 6.5 or 7 percent. Some people have trouble getting their glucose that low, and your physician will help you decide what A1C target seems to be optimal for you. A sudden change in your A1C may indicate that you need a change in treatment. Traditionally, the A1C was just a laboratory test. Now, there are A1C test kits that allow you to also check at home. Self-monitoring of blood glucose (or SMBG) means checking yourself with a home blood glucose monitoring system or meter. How is this different from the A1C? The A1C gives you an average of your blood glucose values over a period of two to three months - but only self-testing tells you what your glucose level is at an exact time. Think of the A1C as a semester test - telling you how you've been performing overall. A self-test with a meter, on the other hand, is more like a pop quiz, testing you on your performance right now. This more immediate information helps you see more exactly how food, exercise, stress and medicines are affecting your blood glucose level throughout the day. It is recommended that all people with diabetes have a glucose monitor and know how to test themselves. However, there is no one standard as to when to test, or how often. Your self-testing plans depend on how you manage your diabetes and how well you are in control. It can be very important to self-test around insulin injections, to be sure that you are getting the results you expect. Your reactions to diabetes medications can also be checked with a self-test. Tests around meals and exercise can also be helpful. For example, testing before a meal can help you decide if you might need to vary your carb choices. 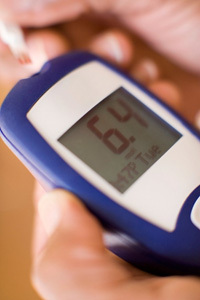 Testing before exercise can help you decide if you're at risk for hypoglycemia. Testing after these events can help you see if you're maintaining your glucose at the right level. In all cases, it's not enough to just do a check. You must also understand how to interpret the results - if they have gone too high, for example - and how to modify your day-to-day care, if necessary. People with Type 1 diabetes (who take insulin via injections or insulin pumps): Test 3 or more times per day. 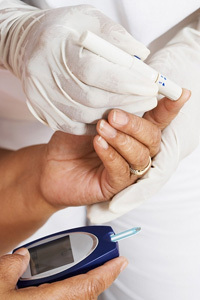 Type 2 diabetes and using diabetes medications and insulin: Test 3 or 4 times a day. Type 2 diabetes , using medications, and having trouble achieving good control: Test 2 or 4 times a day. Type 2 diabetes and managing with diet/exercise only: No standard recommendation; work with your healthcare team. Again, recommendations vary with each person's situation. As you develop your self-care routines, you will probably start to see places where a test result might give you good information. For example, many people like to do a "fasting test" when they wake up, as a gauge to start the day. If you're worried about your meal planning, you may want to do a "pre-prandial" and "post-prandial" test (before the meal and two hours after), to do a "before-and-after" comparison. You may test before exercise, in order to know that your glucose is at a healthy range. And you may certainly want to test if you are feeling stressed, or if you're getting sick - two times when you may experience poorly controlled glucose.